The tree is dying on top or the trunk is starting to decay. These are signs that your tree is indeed dying and that can cause it to topple or break easier around your home. Root structures are coming for your home. 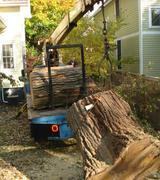 Tree removal is cheaper than roots in your sewer system to repair. If you notice that the tree’s roots are growing closer to your home, consider removing that tree before it becomes a bigger problem. There are cracks in the main trunk. These are sometimes hard to spot. If you notice this problem have a professional like U.S. Tree Service come out and inspect your tree. Your tree is going to grow into our power or cable lines. This can cause problems for you in the future. Sometimes trimming can avoid these problems, but if it is going to be constant you want to consider removing the tree. Look for disease problems for trees or insect infestations in your tree. These can spread to other trees on the property and make it easier for your home to become infested with pests you don’t want. Your tree is leaning toward your house, or cars on the driveway. This issue is easy to spot. If your tree is leaning toward your house call us immediately to make sure that the tree is stable and if it needs to be removed. Your tree is dead. This is an unfortunate problem and can make your property unsightly. Call U.S. Tree Service and we will give it a proper send off. 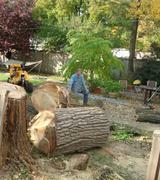 U.S. Tree Service is your number one option for tree removal services in the northwest suburbs of Illinois. We will ensure that your tree removal will go smoothly, quickly, and efficiently. 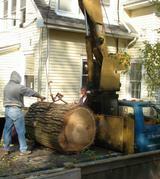 Tree removal can sometimes be difficult because of the attachment you might have to your tree. Also, tree removal can be avoided and sometimes basic tree trimming can take care of the problem. However, if you notice any of these problems with your tree, then tree removal, is a must. U.S. Tree Service is ready to help you with your tree removal service today. Please, never try to remove a tree or try to bring down a tree without calling a professional. If it falls the wrong way or is not taken down with precision this can kill someone. Contact us today!